iPhone Calendar app always contains something important you need, such as meeting date and sb’s birthday. After purchasing a new iPhone 7, you may want to sync these important info from old device to your new iPhone 7, keep the info with you on the way. However, you may have encountered some issues that stop you from syncing your iPhone calendar with iCloud. Then how to fix it? Below we gives you some tips that may be helpful. Tip 1. Turn off iCloud Calendar and then turn on. Tip 2. Restart your iPhone and re-try. Tip 3. Check whether you turn on Push by going to Settings > Calendar > Accounts > Fetch New Data > iCloud. Tip 4. Check your network connection, make sure it works well. Tip 5. Use alternative way, some transferring tool, for example AnyTrans can merge Calendar, contacts and messages from old device to new device. Have been using iPhone 7 for some days, you stored so many messages threads on new mobile phone? With various effects and emojis, you are suggested to clean your Messages app. But before deleting messages, you may want to backup and print some funny, valuable and important messages conversation. So how to print messages on iPhone 7? How to Print A Messages on iPhone 7? If you just want to print a message, it could be very simple. Just capture a screenshot of the message and send the screenshot to your computer, then you can print it. 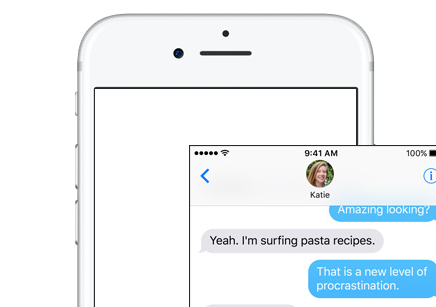 How to Print Whole Message Conversation on iPhone 7? But what if you want to print a complete message conversation.? It seems a little hard. If you plan to print message chatting history of one person, you may need the help of some professional iPhone managing tool, such as AnyTrans. This tool helps you save message conversation to printable files on your computer. In this way, you can print the whole message conversation on your iPhone 7. After updating to iOS 10.1, you may found that your contacts names gone with only messages contents display on your Messages app. In this situation, how can you get back your contacts on your iPhone 7. Below we collected some tips that you can use and have a try to get back contacts name back to your iPhone 7 messages app. Hard Reset could be a common way to fix this your messages problem and get back disappeared contacts name. Just hold on both Home and Power buttons till your iPhone goes black and restart. It’s said this tip is helpful for solving your contacts name gone issue. By simply going to Settings > General > Reset > Reset Network Setting, you can get it. After reset all network settings, make sure to re-connect your Cellular or Wi-Fi. You can update software to be latest if there are some new versions of iOS to fix this problems. You contacts issues may be some iOS bugs. Method 4. iCloud, Gmail or some other cloud contacts service. If you are using iCloud Contacts, Gmail Contacts or some other cloud contacts services, you should make sure you have turned on them on Settings > Contacts > Accounts. Some iPhone iPad users reported that Messages app goes slowly and has no response after updating to iOS 10 or iOS 10.1. So if you meet this issue and cannot use Messages app in normal, how can you fix it. below we gives you some simple tips to fix this iOS problem. Make sure you are logging into a stable network, no matter using Wi-Fi or Cellular network. Reset Network Settings. you can reset all settings of your Network by going to Settings > General > Reset > Reset Network Settings. Restart your iPhone. If your Messages app can’t be shut down, you can force restart your device by holding both Home and Power buttons. Recently I went through a question on Apple Communities saying “I bought a new iphone 7. I did the backup and restore, and everything is good, but I don’t have any of my ringtones on my new iphone 7. How can I get them without having to buy them again?”. As it said in the question, you cannot put ringtones to new iPhone 7 from your old device by restoring with iTunes or iCloud. Because you can’t backup ringtones to iTunes or iCloud. 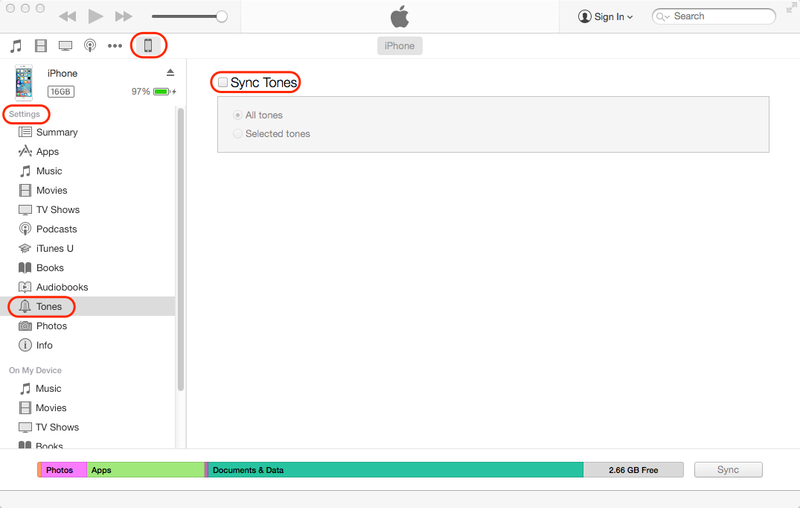 So what can you do to sync ringtones from iPhone to iPhone? With iTunes, you can sync all purchased items from old iPhone to new iPhone. In this way, you can transfer some purchased ringtones to your new iPhone 7. Actually, iTunes allows you to sync purchased items to iTunes from your iPhone. After launch iTunes on your computer and connect your old iPhone to iTunes, you can find one item named “Transfer Purchased from…” under iTunes menu > File > Devices, which helps you import purchased songs, ringtones and others from your iPhone to iTunes. After importing all purchased items to iTunes, now you can sync your iTunes library to iPhone 7. You should connect your iPhone 7 to computer. After iTunes recognizes your device, click your iPhone 7 icon and go to Settings > Tones to Sync Tones to your iPhone 7 or iPhone 7 Plus. iTunes and iCloud are unhelpful in transferring Non-Purchased items between your old iPhone and new iPhone. And AirDrop cannot transfer ringtones, too. In this case, you have to re-make some custom ringtones by using some best iPhone ringtone apps and sync them to your iPhone 7, or using some professional transfer tools, such as AnyTrans, which allows you to transfer selected ringtones between two iOS devices. 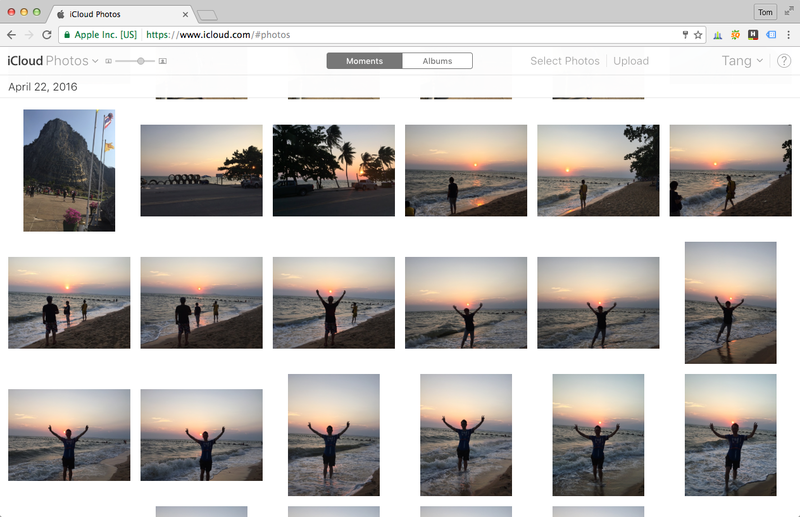 It’s deeply frustrating if you lost all iPhone photos after iOS upgrade. Usually, there are some basic tips that you can have a try to get back disappeared photos after iOS update failure, such as restart iPhone, re-login iCloud account, or turn on your iCloud Photos Stream or iCloud Photo Library. Below we gives you some of these tips. Usually, your iPhone photos will be automatically backed up to iCloud if you keep logging into iCloud and turning on My Photo Stream or iCloud Photo Library. You can check whether the photos are stored on your iCloud by logging in iCloud.com. If you turn on iCloud Backup under Settings > iCloud > Backup, your device will be automatically backed up to iCloud in some specific condition, which means you have chance to get back photos from your recent iCloud Backup. But before you restore your device from the iCloud backup, you’d better use some iCloud backup viewers to see whether there are some lost photos in the backups. If you are used to running iTunes to backup your iPhone iPad, you are lucky because your missing photos are probably in the backup. And you can restore your device to get back what iOS 10 deleted. Of course, if you want to know what’s in the backups, you can use some top backup viewing tools. Normally if we choose to keep messages forever under Settings > Messages > Messages History, we can store all messages conversations on our device. However, recently some users reported that their old iMessages conversations disappeared accidentally in iOS 11 even though they’ve chosen it be forever. “I keep all my texts from the people I regularly text and I was going back on a convo and wanted to see something they texted me a month ago, but i was scrolling up like I normally do, and it stopped at a certain point and wouldn’t load anymore. Now I know I didn’t delete the texts before that point, and I tried with other people and it’s letting me go back up to a year. I tried force closing the Messages app and restarting my phone and nothing. What’s weird is the person in particular’s messages wont load after a certain point but all the photos/gifs we’ve sent each other still appear in the “details” button. Above is one of iPhone 7 Plus users reported on Apple Communities saying iMessages not loading old messages and all old messages missing from iPhone. Among all iPhone messages issues, this issue can be the biggest because you would lose something. And if we get this issue, is there some tips to fix it and get back lost messages? Turn off iMessages and then turn on it by going to Settings > Messages. Power off your iPhone and restart your device. Or hold on both “Power” and “Home” to force restart your device. Restore your iPhone from recently backup to get back old messages. If you have so many backups, you may need an iPhone backup extractor for help to view contents on backups without restoring. If you have some better ideas to get back disappearing old messages, please let us know by leaving a comment. Many thanks!